KISS Kam announcement on the Times Square board in New York. 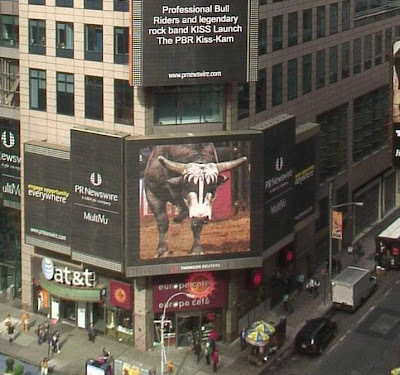 Professional Bull Riders and KISS have teamed up to create the 8-Second KISS Kam, an innovative twist on the long-standing tradition in many sports venues where couples in the audience are highlighted on the large, in-venue video screens and encouraged to engage in a public display of affection. In typical PBR and KISS fashion, the innovative KISS Kam has a twist. Just like a successful bull ride, our participants are timed with a digital clock and must kiss for 8 seconds or face the ridicule of tens of thousands of PBR fans. Band members Paul Stanley, Tommy Thayer, Eric Singer and Gene Simmons cheer fans on and provide constructive criticism via video during the promotion. Videos from the 8-second kissing couples will be recorded and posted online at www.pbr.com/KISS where visitors can vote for the best (or worst) kiss and register to win valuable PBR and KISS prizes.